It’s a bit of a follow up from my achievement last June when I passed the 70-486 MVC exam. 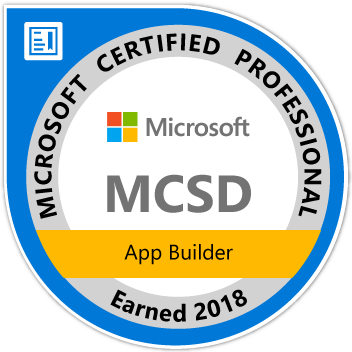 I thought that I’d get the MCSD because I completed two (old/previous) UWP related exams before. But there was a bug in the cert planner. I had to wait a long time to hear from Microsoft, but unfortunately I had to take another exam to get the MCSD. I choose 70-532 because I wanted to go for MCSA: Cloud platform. So I ordered the v2 of the exam guide and studied every day during my holiday. I found out (later) that the 70-532 and 70-535 and some more, will be deprecated by the end of the year… and will be replaced. But first, let me enjoy my MCSD. I started to use it because there is no SQL Agent in Azure SQL databases. I relied on SQL Agent to perform Ola’s database maintenance scripts. I use the Azure automation with Runbooks now for a long time to build reports from Azure SQL and have them send to people by SMTP. I did build the powershell locally first. So I found this module to work with Excel in Powershell without Excel on GitHub. It uses Epplus. Which I mentioned in my post from 6 years ago. But I realised that I could also just use Azure Functions and code in C# and have a time trigger. This enables me to write my beloved C# rather then scripting Powershell. I can also just use the Epplus nuget package. The Visual Studio dialog can be unclear if you visit it for the first time and have no clue that the schedule uses CRON notation. Maybe they will change it, but now you know. I wanted to try Microsoft Flow for the first time. So I thought of a use-case and came up with a thing that has been bothering me for a while. When I have an epic moment while gaming on my Xbox, I can capture it with a quick double tap on the Xbox icon and the ‘x’ button. So if the recording is done, you get a notification and keep the xbox icon pressed to put it up on OneDrive. This is my use-case! I have seen several options (how ironically) on YouTube about using the YouTube app for Xbox. But I want to auto-upload and have it set to private. So that I only have to occasionally look into my YT account and crop, caption, publish them. But it will be the easiest option, because the files are already at the right destination. Sorry for the Dutch. But it says: when a file is made, make a file on Dropbox. I have specified the video/xbox dir for onedrive and made a new dir on Dropbox as target. So Flow lacks some options… I had an old but still active IFTTT account (if this, than that) but that also won’t work. So I searched some more and found Zapier. It appears that I could also leave out flow and just use OneDrive to YouTube there. But I wanted to use Flow, so I kept the Dropbox step. So I configured Zapier to auto upload a new Dropbox file and it’s done. I found out that they are hiring, but they use a totally different stack then what I prefer. so perhaps it’s something for you dear reader. They have some great docs about creating an Zapier app with the node.js sdk. But as I have said. I like a different stack. So here is a C# approach with webhooks for Zapier. They should/could add (unsupported) C# docs to their official site. So I finally have a semi auto upload to YouTube. A quick tap-tap on the xbox button on the controller and hit the X to record the last 30 seconds. Send it to Onedrive and from there it’s auto to dropbox and automatically to YouTube (as private) video ready for captioning an publishing it. Maybe someday when I have some spare time, I’d automate it even more or better but for now: good luck and take care! I could drill into the Azure portal to see what was causing this spike and recognized the SQL statement, so I knew which product to update the SQL for. However this was not even necessary. From an average of 4250 down to 50! The automatic index advice is extremely limited, and often misleading, so can only be considered as a starting point. Hope this info might help someone troubleshooting Azure Db perf!